← Should Civil Servants be ‘ranked and yanked’? Yesterday, Ed Miliband waded into that most toxic of political subjects with a speech on immigration. Labour, he said, got its immigration policy wrong. He will inevitably be shot at from at least two entrenched positions. Whatever he says will never go far enough to satisfy the likes of Migration Watch. Critics on the left will accuse him of stoking xenophobia just my mentioning immigration. But no party leader can avoid something that worries so many people. As Guardian stalwarts Michael White and Jonathan Freedland pointed out today, Labour ignores such strong feelings at its peril. Why is immigration such an emotive subject? Concerns about immigration fall into two broad categories, the economic and the cultural. Economic concerns focus on competition for jobs and housing and pressure on public services. The cultural fears are about less tangible factors; the look and feel of the neighbourhood, shifts in attitudes and values and the general sense that immigration is changing British society. Study after study has shown that the overall economic impact of immigration is negligible. Reviews of the research by Oxford University’s Migration Observatory conclude that immigration has very little effect on wage levels and unemployment or on public finances. Over time, immigrants pay taxes and help to create jobs, so their impact on the economy evens itself out. But, as I’ve said before, to paraphrase our former prime minister, there is no such thing as the economy. It is just a term we use to aggregate all the economic activity in the country. While the overall impact of immigration on the economy might be small, the impact on the people who make up the economy varies considerably. To use a crude example, if one person is £100 a week better off and two are £50 a week worse off, the overall impact on all three would be zero. The two who are £50 a week down would be unlikely to see it that way though. UK studies find that immigration has small impact on average wages but more significant impacts along the wage distribution: low-waged workers lose while medium and high-paid workers gain. The greatest wage effects are found for low-waged workers. Dustmann et al (2008) find that each 1 percent increase in the share of migrants in the UK-born working age population leads to a 0.6 percent decline in the wages of the 5% lowest paid workers and to an increase in the wages of higher paid workers. Similarly, another study focusing on wage effects at the occupational level during 1992 and 2006, found that, in the unskilled and semi-skilled service sector, a one percentage point rise in the share of migrants reduced average wages in that occupation by 0.5 percent (Nickell and Salaheen 2008). [I]mmigration was found to have adverse effects on employment, labour market participation and unemployment of UK-born with intermediate education (defined as O level and equivalent) and a positive impact on employment outcomes of UK-born workers with advanced education (A-levels or university degrees). An OECD study of the impact of immigration on the unemployment of domestic workers in OECD countries (including the UK) during 1984-2003 found that an increase in the share of migrants in the labour force increases unemployment in the short to medium term (over a period of 5-10 years) but has no significant impact in the long run (Jean and Jimenez 2007). The trouble is, when you have a mortgage and a business loan to pay, the short to medium term is what you are worried about. I can’t remember who it was that said most of us are only a few pay packets away from poverty but it’s true. If your wages and employment prospects take a hit even for a few months it can be disastrous. I’ve often thought it would be amusing to hear an economist try to explain the Lump of Labour fallacy to the builders and plumbers in my local pub. That the costs and benefits of immigration even themselves out in the end would be of little comfort to them. Unless they can deal with the short-term, people don’t survive to see the long-term. The geographical impact of migration is often uneven too. Areas which receive a sudden influx of migrants may find their services struggling to cope. The overall increase in, say, migrants’ children in schools might be small but if many of them arrive in one town, the teachers will find it hard to deal with the increase in non-English speaking pupils. A small number of migrants can stretch resources severely if they are concentrated in a small number of places. So, as Ed Miliband said yesterday, the aggregate economic data might look fine but “the aggregate is not where people live their lives.” In the short-term, immigration hits some people hard. …..Mirror-reading fears over jobs and housing, or Mail-stirred concerns over cultural continuity and cohesion. I’m not sure he’s right though. Mixed in with the grievances about jobs and wages, you often hear people complaining about how urban areas have changed. In cities, because they are crowded together, the people make the place in a way they don’t so much in the country. Different people moving in can change the look and feel of the place dramatically and very quickly. We take it for granted that people who live in the countryside will complain about development spoiling their views. That’s why so many rural and coastal dwellers hate wind farms. They change the landscape. But in cities, people do that. If the area in which you grew up now has shops with strange writing on and women walking the streets with their faces covered, the scene that you see every day has changed just as surely as if a wind-farm had been built next to your cottage. Inevitably, some people find this deeply disturbing. The behaviour and attitudes of the newcomers are often different too. As Edgar Schein said, culture is underpinned by sub-conscious shared assumptions and beliefs. We often don’t realise we have these assumptions until we encounter people who don’t share them. During corporate mergers, we take it as read that people will feel nervous when they are thrown together with people from a different company culture. So why, then, is it so surprising that people react so strongly to those from another country or continent? Questions of cultural and social cohesion are much more difficult to assess than economic ones. As Migration Observatory points out, there are no agreed definitions. Evidence from the US and Canada, they say, indicates a negative relationship between ethnic diversity and social cohesion, while that from Europe is more mixed, suggesting that income inequality and deprivation may be more important determinants. In practice, it is difficult to disentangle the two. It is in the working class urban areas where the cultural and economic concerns reinforce each other. The migrants settle in the areas where the people who lose the most economically from immigration live. So, not only are the locals fearing for their pay levels and job security, they also have to live near to the newcomers and find themselves assailed with the unfamiliar sights and sounds they bring with them. It would be very surprising if this didn’t make people feel a bit uneasy. Net immigration seems to have become the standard measure used by politicians in debates about immigration. This implicitly focuses on the economic arguments. It’s all about the number of people we have and the impact on resources. If half-a-million people arrive and half-a-million people leave then that’s OK because the same number of people are here requiring jobs, housing and public services. 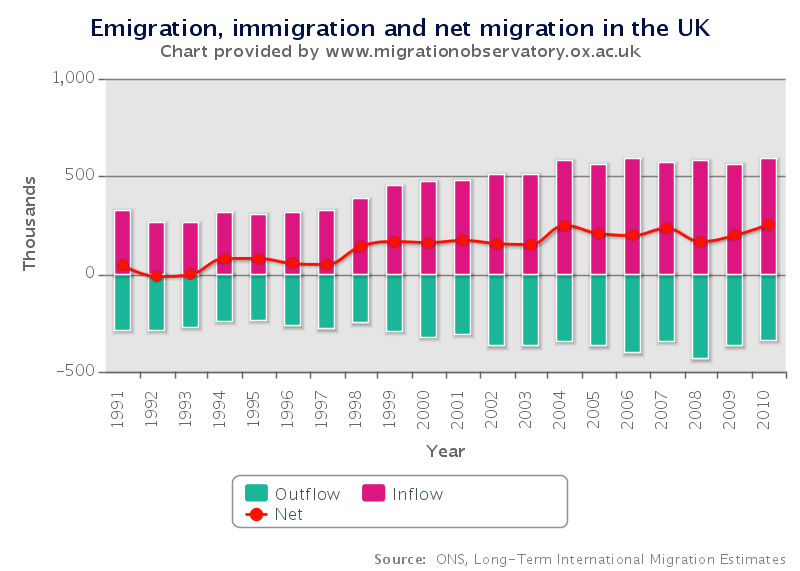 The figures in this chart from Migration Observatory show a gradual rise in net immigration during the Labour years, which is the criticism Ed Miliband was trying to answer in his speech. The jump in 2004 when citizens of the EU’s new East European member states were allowed to work in the UK, is clear. The target is focused on an esoteric measure – net migration is the surplus of immigration over emigration, but this means very little to the public. For example, while net immigration was 226,000 in the year to June 2010, emigration was 346,000, so (gross) immigration was 572,000. To translate this into something approximating the experiences of ordinary people, think about 57 new migrants moving to a community and 35 leaving. The net impact on the local population is relatively small, but it represents a lot of coming and going. Net migration could be zero and people might still be very worried about immigration, for example if a million people came to the UK while a million others left. The most recent year’s figures neatly illustrate these limitations. Net immigration was at its highest since records began not because more people arrived but because fewer left. Those who are concerned about the longer-term changes brought about by immigration are likely to be more interested in how many people stay than who comes and goes. Here, the data are more accurate because the grant of settlement is a legal process. The number of people settling permanently in the UK has increased significantly over the last fifteen years. We are accustomed to thinking of the 60s and 70s as the era of mass immigration, which it was compared to what had gone before. However the years since 1997 have seen an increase almost every year in the number of people allowed to settle in the UK. Given that both short-term and long-term migration have increased during Labour’s term of office, it would be surprising if the party did not get some stick for it. As the economic and social impact of immigration tends to be concentrated in certain areas, it is understandable that some people will feel uneasy about the process. For some people it is a massive and seemingly threatening change. In any other context, we would see such adverse reactions as normal. If we were looking at this as a corporate change project, we would be putting up the Kubler-Ross grief curve and telling the directors to prepare for a rough ride. Yet, when people complain about immigration, we dismiss them as bigots. So what should be done about it? Well that’s an even more difficult question. “No one asked us whether we wanted this; we didn’t vote for it,” goes the anguished cry. Yet the same is true for all social change. No-one asked for industrialisation, urban sprawl or an ageing population. They just happened. A fascinating programme on BBC2 last week showed how, in less than 200 years, Camberwell Grove went from being an affluent middle-class area, to one of tenements and squats, and back again, taking in all stages in between. No-one voted for that to happen; it just did. The factors which have contributed to immigration haven’t gone away. The UN says that the number of refugees is at a fifteen year high. You don’t have to be a tree-hugger to worry that climate change threatens to make the situation worse. Military strategists are taking it very seriously and so is the insurance industry. It is reasonable to assume that the number of refugees will increase and that at least some of them will want to come to Britain. Many people will find this prospect disturbing; it would be surprising if they didn’t. But rather than ignoring it, or refusing to mention it under the misguided belief that discussing immigration fuels xenophobia, party leaders need to start having a proper debate. If politicians like Ed Miliband don’t discuss immigration, it gives the real xenophobes a free rein to set the terms of the debate. Immigration is a complex subject and I have only scratched the surface of it here. I thought hard before writing this post because anyone who mentions immigration seems to get grief from somebody. (I notice that Michael White has not opened the comments on his article.) But if the discussion is left to those who make simplistic and ill-informed assertions we will get nowhere. All the signs suggest that the number of people wanting to come to Britain will increase over the next decade or so and that governments will struggle to control their numbers. Inevitably, this will make a lot of people uneasy. Managing these pressures is going to be difficult for whoever is in power but ignoring them won’t make them go away. I hope you don’t get too much grief for this – or indeed any – as this is one of the most thoughtful and balanced pieces on the subject I can recall reading. A good article, but I’d be cautious about foregrounding refugees as a major factor contributing to immigration. Refugees and asylum seekers only account for about 5% of all immigrants. The bulk of immigration (and emigration) is by economic migrants. Also, bear in mind that refugees are unwilling. They tend to flee to the nearest place of shelter, hence most refugees from war in Africa are to be found in neighbouring states. Similarly, we should be sceptical of claims that climate change will cause a massive increase in immigration, like some latterday barbarian invasion of the Roman Empire. It may well trigger movements of population, but these are likely to be localised. Communities aren’t going to seek relocation half way around the world. In contrast, economic migrants will cut ties and go where the work is. Part of the high emotion of immigration is that it brings into proximity two extreme personality types: the unadventurous stay-at-home, who fears change, and the get-up-and-go self improver, who seeks opportunity. The BBC series on London’s streets that you refer to has highlighted this tension in terms of class movements, e.g. middle class gentrifiers immigrating to working class streets. Good catch Dave. What I meant to say, but didn’t, was that the pressures which are increasing the number of refugees will increase the number of economic migrants too. Even though our economy is weakening, the UK’s GDP per head will remain high relative to many places in the rest of the world. For many people, Britain will look like a better bet than where they are. If climate change and resource conflicts make things worse, more people will seek a future elsewhere. In short, I can’t see the factors which have led to the increase in migration changing in the near future. You’re absolutely right that this needs to be discussed Rick; and also correct that if proper discussion doesn’t occur, improper (by which I mean unpleasant, unfair) commentary will fill the gap instead. I’d suggest, however, that there’s also another dimension to be factored in, viz, population in the demographic sense. There are lots of people in Britain, and the number is going up. In that respect healthy young men – who comprise the largest group of incoming workers – actually help to balance the dependency ratio more comfortably and should by any rationale be welcome; they make little demand on services, they contribute to the economy (tho I take the point about swings and roundabouts for low-waged UK workers) and they don’t, on their own, reproduce / add to the number of dependents in the UK. Firstly, workers who do stay on in the UK have families, and these families may be larger than the norm. The obvious response to this is: if the women concerned are educated and there are opportunities, the number of children will be smaller and the quality of their early years , however well-meaning their parents would be anyway, is likely to be better – i.e. they will grow up better educated themselves, and healthier. The ‘answer’ is not to refuse reasonable access to the UK for genuine spouses, but surely to ensure that people who arrive are / will shortly be equipped to cope well in the UK. And secondly, there is a real problem with the family size of some seriously wealthy UK people who think it OK to have very large families. Very wealthy people consume far more than their fair share of global resources, and when they have large families that problem becomes much larger still. Individuals all arrive on this planet innocent and without volition on their own part, so no use ‘blaming’ wealthy babies any more than ‘foreign’ ones; we are all in this together in that respect. But as adults we all have responsibilities, so maybe wealthy adults need education too – in how to respect the finite resources available? Whilst then we can understand the perceived ‘problems’ (from some perspectives) of immigration, I do worry that this current discussion is not balanced by consideration also of other serious pressures of various sorts on our economy and social structures. We do all need to think about the bigger demographic issues as well; and large families, especially large wealthy, resource-demanding families, are also a significant factor in increasing these pressures in ways just as important in the long-term as the availability or not of jobs now. In the family size scenario it’s not national / ethnic identity which is significant; rather, social class is (as things stand) the major factor in distinguishing excessive demands on resources from more modest ones. Low income families may in the first generation be large, but as we noted with education and opportunities, second and subsequent generations are likely to have smaller families. Very wealthy people however may persist in having large families simply because they can. Of course Ed Miliband is right now to address ‘ordinary’ people’s worries about jobs, and of course things can be done to make that better, given political will. But the longer-term challenges of population growth will eventually be even more impactful on ordinary people and their standard of living, unless these issues are also thought through soon. And discussing all this would take political courage of a dimension much bigger than simply initiating a sensible debate about jobs and (?) migrant workers, wouldn’t it? It’s a serious – not to mention highly complex – issue and does need to be debated. Well done on presented a balanced view. Here’s another factor. I’m British, born and bred. My South African husband is not legally allowed to live with me (as he is technically an ‘immigrant’) unless he applies to. The process for him to stay here is long and expensive. His spouse visa cost him over £1000; indefinite leave to remain costs him another £1000. For both, he cannot draw any money from the state and has to prove he can live here financially without doing so. (no state handouts) In actual fact, he helps the economy, not drains it!! To be a British citizen, he has to fork out another £1000. Another money spinner. It winds me up that we have to pay to have my human rights to live with my hubby allowed, whereas thousands of British citizens who don’t earn a penny to help the economy are given endless payouts. That is the real issue which should be debated. To be honest, I think your argument about the costs of obtaining your human right to be with your husband is better made without the commentary about ‘thousands of British citizens who don’t earn a penny to help the economy’… quite a lot of these people (of course, not all) are children, the elderly or others who simply can’t work for valid reasons. Your case, as a British citizen, seems from here very reasonable. Why let it get get wound up with other and different quite complex issues? But good that we all seem to agree Rick has raised an important matter in a responsible and balanced way. If it’s that bad here why not go to South Africa with your husband? Another failing of the aggregate approach which you touch on but deserves a bit more attention is the geographic disparity. If a large number of immigrants settle in your local council area, while 10,000 people from elsewhere in the UK emigrate then you will find huge pressures on social services, housing, NHS and schools, in your local area – but net migration is zero. Part of the big failing is that our census data etc. is so rarely collected that a council can suffer shortages for years before the budget is corrected for the increase in population. Worth noting as well that in the South East, this pressure is exacerbated by internal migration too. My own view is that the impact of immigration is greatly exaggerated, and that it is a scapegoat for insecurities that are far more to do with other economic factors and policies that favour the rich at the expense of the average person. I don’t think your post provides anything to change that view. 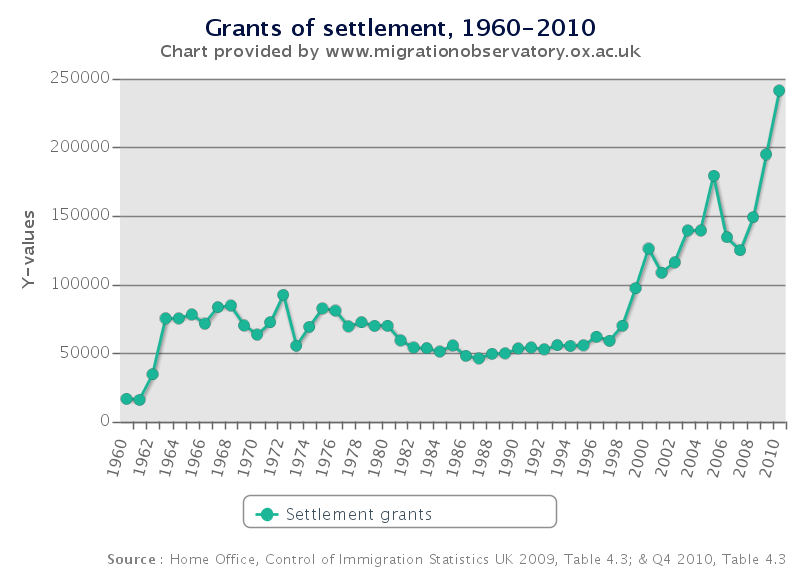 You also quote figures on settlement which do show a dramatic increase since 1997. I went to the migration observatory website to find out more – it looks like the increase was driven by higher levels of highly skilled workers being given permanent residency. I suspect many of these will have been employed in IT, finance and medicine, hardly areas of breadline wages and huge unemployment. But the bulk of your article goes back to the usual ‘cultural’ arguments about funny writing and women with hidden faces. When I hear these, I always think ‘how fragile must the existing culture be to feel so threatened by this?’. The answer is that it must have been already undermined by a lack of housebuilding, destruction of existing manufacturing industries, neutering of unions, a casual labour culture, and so on. Immigration is just the scapegoat for insecurities that have other sources. No-one has claimed it’s “surprising”, just that it’s not justified. Do you think the public were right abut the “Wandering Jew”?